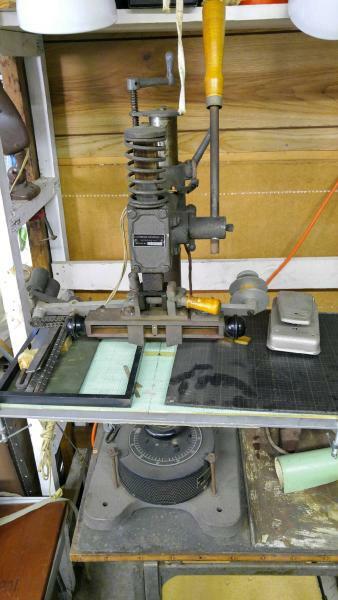 Small letterpress shop for sale in San Diego CA. Presses available include: 3 x 5 Kelsey (rollers missing); Adana Hand Press with self inker; 3 x 5 “Baltimorian” press; table top paper cutter; Kwikprint Foil Stamper; Challenge Galley Proof Press circa 1890; three cabinets of printers type. This is an estate sale so I cannot verify condition, completeness except for what you see in the pictures. Definitely a chance to acquire several small letterpresses, foil stamper and material at a great price! The deceased owner was a book seller who used the material for small impressions and foil stamping. The type is in good condition and mostly 10 to 16 pt book faces. $1,500 for the entire lot. If you are only interested in a particular item, please make me a reasonable offer on that. Need to dispose of the equipment by the end of November. Thanks. Best to give me a call.